Showing up at Disneyland on a whim is good. But maximizing your Disneyland experience involves a bit of planning and prioritizing. Intentionality, even. Your school experience is the same. First, a disclaimer. By the remarks that follow, I do not mean to suggest that we have arrived at our philosophical or cultural destination. Neither do I wish to suggest that we’re awesome in and of ourselves. It is unmistakable, however, that God has blessed ECS beyond our most presumptuous requests, and He’s done so using lots of crazy means, like people, curriculum and the gospel. We cannot take credit for any of this, even though we’ve been in the middle of it. Rather, I say this as one who has been shaped and grown in staggering and unexpected ways the last six years, as both a teacher and as a parent who is trying to navigate some unfamiliar waters…and I’m very glad to be joined by some pretty good swimmers. Parents, I believe that your intentional investment in our school’s culture is good for you and your children. You get to know the people who are pouring into your children and you get to be a part of making the culture better. That said, I would like to suggest (in no particular order) some ways that you can maximize your family’s experience with Evangel Classical School. Matins sets the tone for the day at ECS. I love seeing all the Raggants in one place, excited to start the day. More than once their enthusiasm has swept me up and my hurried heart has been warmed and filled. When you come to drop off your student, consider sticking around until about 9:07 to see the school come together, to get to join some happy treble voices in a hymn or psalm, to be reminded of our Creed, and to pray. You can even give one more hug before sending them off to first period. Get out of your car after school. I love Matins, but the 3:00 hour is my favorite part of the school day, and not just because the lessons are over. I enjoy our people rubbing off on one another, sharing thoughts, victories, struggles and stories while the Raggants scamper about filling the air with giggles and footballs. Some administrators get nervous when they see a knot of moms yammering in the parking lot. I love it. Take some time to talk and visit and brainstorm and just enjoy the other school families. Odds are you’ll leave encouraged. Have your child’s teacher over for dinner. Relationships are important, and spending time cultivating a relationship with the person who is investing in your child is well spent. What’s more, when we are engaged in the sort of heart-work demanded of education, there are bound to be opportunities to practice forgiveness, and that’s easier when the relationships have been strengthened. I would rather have the ECS teachers than any teaching staff on the planet, and it’s not just for sentimental reasons. They are a gift to our school and our families, and getting to know them (and their spouses) is wise. You’ll get to show your appreciation for them, and they’ll get to know you and your students better, better enabling them to serve you. Read your Raggant’s literature books. I love talking with my children about the books they’re reading, and even more so when I’m familiar with the books. I’m able to help them make sense of what they’re reading and discuss themes, issues and characters. If your child is in Omnibus and you cannot keep up with that reading load, consider at least reading the introductions to the text in the Omnibus textbook. (Ask your students what I mean; they can tell you). You’ll be better equipped to help and support your student while also getting some great worldview training yourself. Besides, many of us are (righteously, of course) jealous of what our children are getting; this is one small way to make up for lost time and opportunities. Tell a friend about the school. 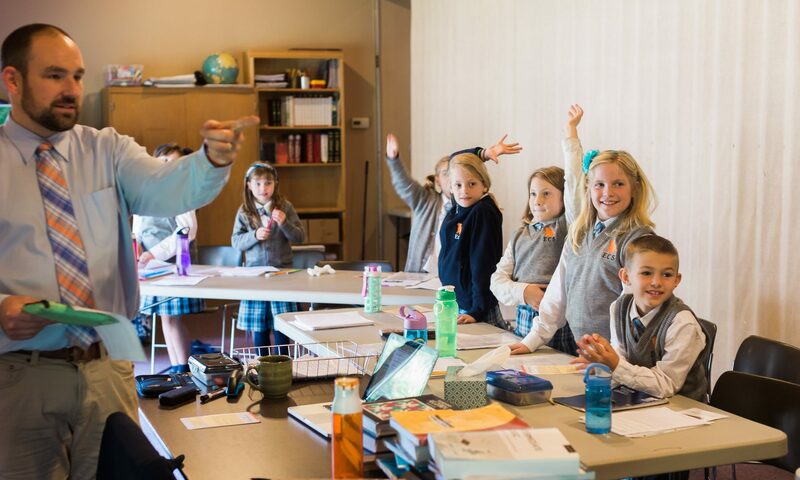 When you tell others about ECS, you may find yourself forced to articulate the school’s vision and mission. This is always a good exercise. It’s a normal Christian practice to gush to others about the stuff we love. Hopefully you feel this way about the school. Pray for the teachers and other families. Praying for people impacts my attitude toward them. It grows my compassion and helps to align my own attitudes as I go to God on their behalf. What’s more, it’s loving and obedient…two things we’d like to see in our children. This may be hard to believe, but I mean it. When I drop in on classes, I always leave encouraged, and I trust you would, too. Perhaps you’d like to hear Mr. Higgins’ Nacho Libre impersonations or how Mr. Bowers makes Prince Henry the Navigator a fascinating character. Perhaps you want to learn how Miss Bour puts awesome dance moves to the Bible songs or eavesdrop while Omnibus students discuss Just War Theory. We love having parents around the school, so you’re most welcome to drop in. And there’re likely more ideas, and I’d be glad to hear them all. The more we’re investing in our school community, the better it will be, and the more we’ll get out of it.